All these combine into one incredible cake. It has a rich flavor, but not heavy. It is really, really good. You should make this. Serious. Really. How do I know? Well, I made this at 4 am this morning, then brought it into work. I share treats with my office mates first, then put it out for the rest of the staff. This morning, the guys got their piece and within 15 minutes my co-worker asks, "How long do I have to leave it out there for the others until I can get a second piece?" We agreed that an hour was good enough (you snooze, you lose) and 62 minutes later, he got the last piece left on the cake stand! This is a super easy, two bowls, no Kitchenaid cake. You always need to have some no Kitchenaid recipes in your recipe box. And sometimes you buy the large Raspberry container at Costco and have a few raspberries to use up. It's super easy. The wet mixture is ricotta cheese, eggs and vanilla. This combines with the dry ingredients then a stick of melted butter is folded into the mix. See, I told you it was easy peasy. I used a 9" by 3" round pan (instead of the usual 9" x 2" round). I think this will rise to very top of a 9" x 2" round pan so don't try to make it in an 8" pan. 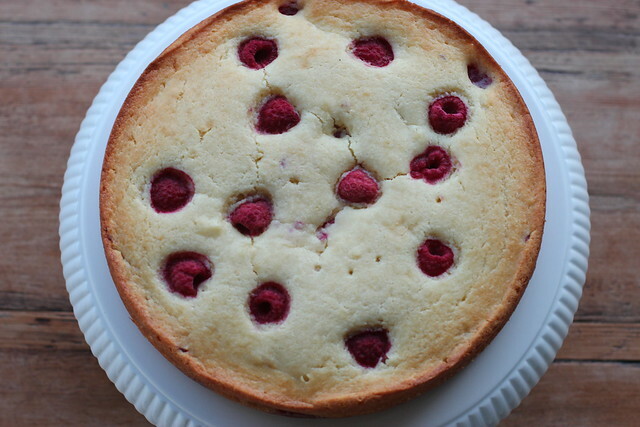 The recipe uses FROZEN raspberries or blackberries, but I used FRESH raspberries only. I used one 6 ounce square package of raspberries. Next time, I might add some lemon zest. 1. Preheat oven to 350°. Line a 9”-diameter cake pan. I used a 9"x3" cake pan. It may rise to the top of a 9"x2" pan. 2. Whisk together the flour, sugar, baking powder, and salt in a large bowl. 3. Whisk eggs, ricotta, and vanilla in a medium bowl until smooth. 4. Pour egg/ricotta mixture onto dry ingredients and fold together until almost all blended. 5. 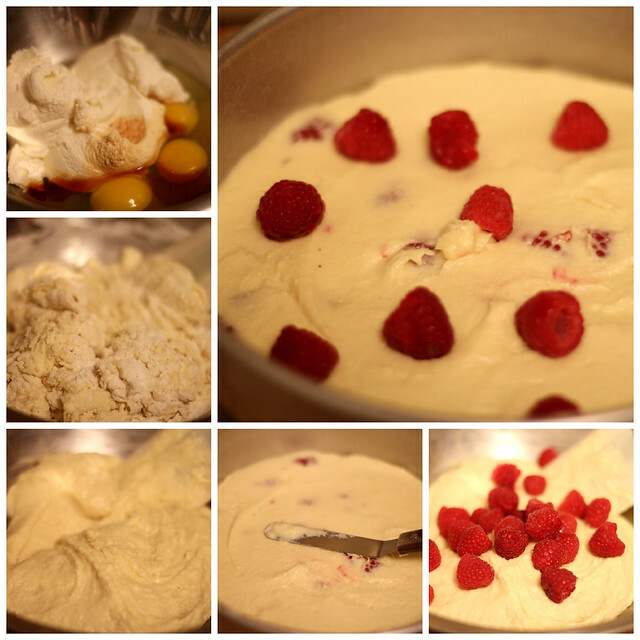 Fold in the melted butter and then add 75% of the raspberries and fold those into the mix. Don't overmix. 6. Put batter into the pan and smooth with an offset spatula. 7. 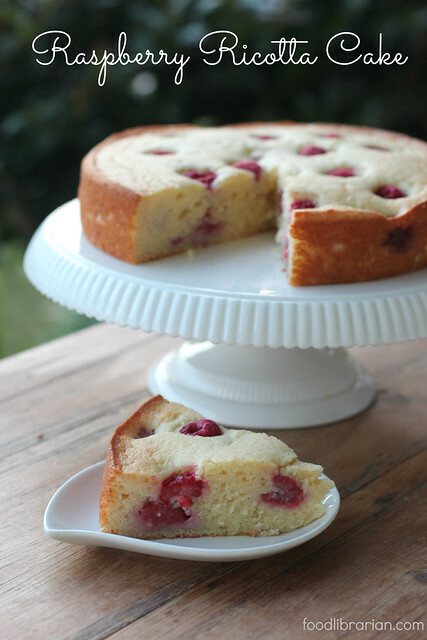 Scatter the remaining raspberries on top of the cake. 8. 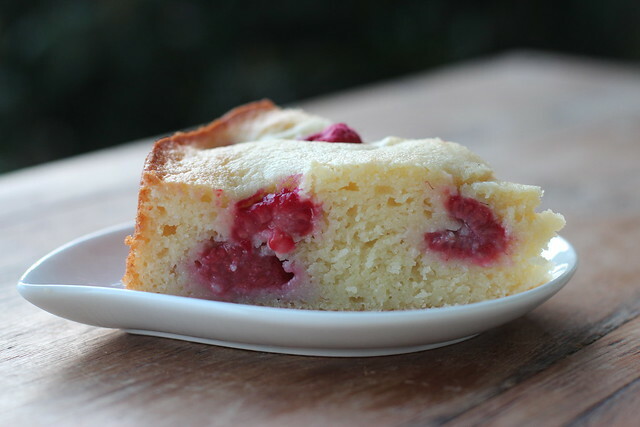 Bake cake until golden brown and a tester inserted into the center comes out clean, 50–60 minutes (mine took 50 minutes, I used fresh raspberries). Let cool at least 20 minutes before unmolding. YUM! This looks awesome. :) Love it! I made this before work today, but used blueberries instead. (Well, and amaretto instead of vanilla, but only because I'm perpetually out of vanilla.) I only had 9x2 cake pans so I scooped out about a 1 cup ramekin's worth and baked that separately, and even with that the cake almost overflowed. Good call on the pan size, anyway. Line the cake pan ... line with what? Do you mean parchment? Any greasing/flouring? @Anonymous I line my pans with parchment and use a baking spray (I use Bak-Klene ZT Nonstick Baking Spray). You can also grease and flour - whatever you use to prep a cake pan.